How does one look at such an aria and begin to study it? Where does one start? The answer is one starts with rhythm and ends with words. In the text one will find that the best clues are in the rhythm and in the dynamics. Actually singing the notes along with the words comes only at the last stage; most of the work is done in stages and one layers his understanding bit by bit. And the best way to start is by trying to figure out what the composer needs to say through his choice of rhythm. Many times the markings are blatant clues regarding what’s happening in an aria. Like everything in life, everything on a score page has a reason and the better the composer, the better the reason. Like Maria Callas once said (and I’m paraphrasing): “it’s all in there, the composer has already seen to it in the music.” At 2:37 Callas interview: One needs do no more than sing. In the case of the above aria, by Giuseppe Verdi, there is no guess work. As what should one feel, the music is already doing that for you, so you as a tenor, only have to deliver what’s on the page. You do that by becoming a good musician. A good interpreter should know his language well. And then translate, word by word and phrase by phrase. Be able to recite it as a poem. The best source of opera word-by-word translation is Nico Castel’s Libretti series which are in many volumes: Il Trovatore is in Volume 4 of the Complete Verdi Libretti. One could easily find it in any major library that houses a section for music reference. (and death seems to me only a way to wait for you in Heaven). The first thing that strikes us when reading the words aloud in the original Italian, is how the rhythm is set. It is after all a poem and it is written in verse. Such is the nature of many arias, in that they are first and foremost poems that should be firstly read and understood before attempting to sing them. When this is done, the aria sings itself in so many ways; by finding the inner rhythm, by finding the rhythm of the phrase, of the natural turn of speech, how it rolls on the tongue, how the words connect, all are elements of which one needs to be aware before building his interpretation from there onwards. So what is it saying? It is a farewell. And why is the character saying these words now? Are they sad, are they hopeful, are they reflective of the past or are they predicting the future? This is a very important aria, which translates into an important moment in the opera. It is essential to the plot, and so it is an extended moment of emotion in the middle of a momentous series of actions that ultimately drives the plot to its tragic climax. This aria is important because the tenor, aka Hero, is singing. The first thing that strikes a classically trained ear is how similar the aria seems to a Mozart or Donizetti aria! It strikes a resemblance to something like Un’aura amorosa from Cosi Fan Tutte. Not like Verdi at all! The continuous legato line, and the general feel of the aria is more classical than romantic. Perhaps Verdi was trying to pay homage to W.A. Mozart or Donizzetti or Bellini; but how are these queries important in terms of a singer’s proper interpretation of the aria? Well, even though something like this is usually felt before it is intellectually processed we have a style and colouring issue of which the singer needs to be aware. Another aria follows this one immediately, that which is far more famous and harder: Di quella pira. 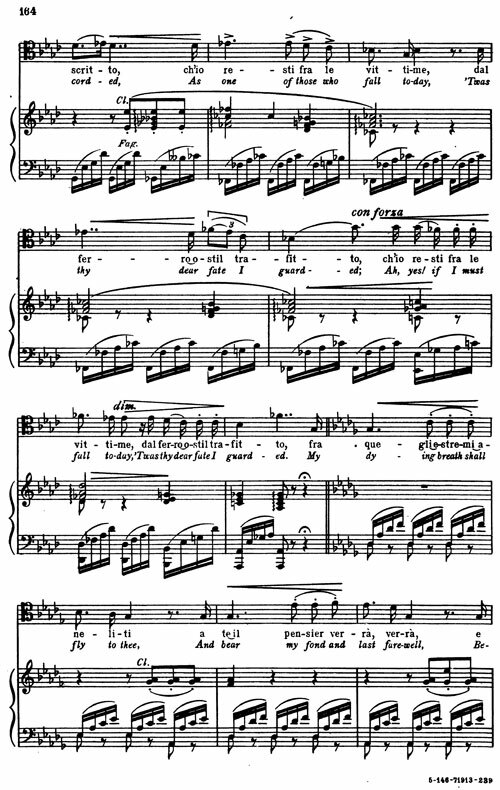 Not only should there be a clear interpretive difference between the two arias, but there should be a conscious effort on the part of the tenor to make the second aria as strikingly opposite in feel from the first, as possible. “Ah si ben mio” is sweet, plaintive and melancholic and there should be nothing aggressive about it. It should have the feel of lightness and purity, martyrdom, sacrifice, and such colours are ethereal, and should be sung that way. As opposed to “Di quella pira” which is basically a call to war! Who and What is this character? Manrico is a troubadour. A troubadour could mean many things and there were high born troubadours in history and low-born as well. However, the main point is that the opera is based on El Trovador, a play by Antonio Garcia Gutierrez written in 1836. Manrinco, the hero, has a mother, who turns out to be a Gypsy who kidnapped him in infancy for her ulterior vengeful reasons. He has an enemy, Count di Luna, whom we learn in the last scene is also his brother. They are both in love with the same woman: Leonora, a noble woman. True! It is a convoluted plot but one that could very well be reality. A singer has to believe in his roles, otherwise, his performance will come off as ridiculous. Remember sometimes truth is stranger than fiction! A singer has to put his character in as much a real perspective as possible. Without this he will lack the human touch that makes his performance plausible and endearing to the audience, which is our main concern. Without a gripped audience, opera is nothing! A young man is born and raised in a remote and barren desert island about which no one cares and where not much happens. He grows up in his nomadic community made of many warring tribes. The Sea surrounds his desert and the coast is a Pirates’ Bay! One day, the English discover oil as part of their expedition of the land, and he, through political savvy and intelligence, becomes a Leader who unites his tribes and guides them to riches beyond imagination. The name of the man: H.H. the late Sheikh Zayed Bin Sultan Al Nhayan, founder of the United Arab Emirates. Sounds like the Count of Monte Cristo or some such novel! But it’s very much the true story of the U.A.E and its founding pioneer. What I’m trying to explain is: if you sing an aria and you’re not 100% convinced of it, then it will show. If you do not believe in the plot of your story, then no one else will. Just because the events never happened to you personally does not mean that they never happened!!! Believe in Santa Claus and he’ll be real enough. Life is bizarre! When one starts the rhythm count, one will see that, with the great composers, every rhythmic gesture, small or large, count for an intended meaning. 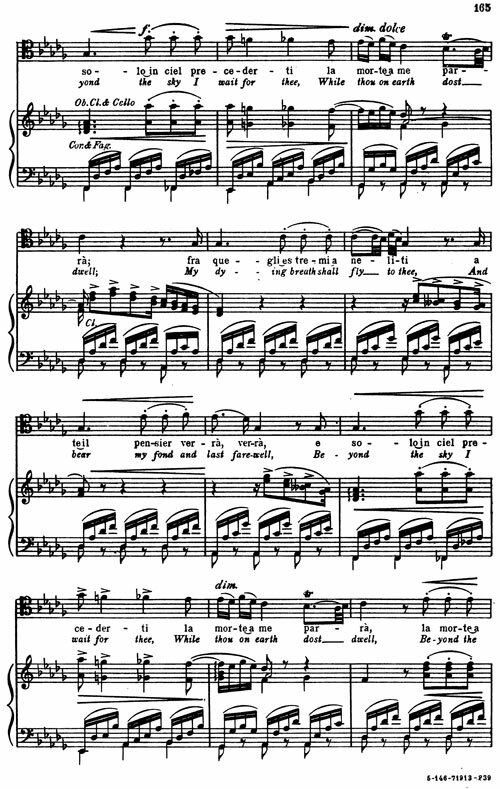 Your job as a singer is to interpret what’s on the page by finding the reason behind the text (meaning notes, rhythm, words and dynamic markings). To interpret…that is a singer’s job. Manrico, after a very brief but important recitative that move the plot forward, starts his aria with 2 words: “Ah, si!” with the value of a 16th note and an elongated quarter note. These are the questions one needs to ask when singing an aria, indeed when singing anything. Why did Verdi choose a 16th instead of a quarter? Does a 16th note give a different colour when sung than a quarter note? Yes! And here’s why: What happens when we get emotional? When on is emotional one is not at ease. One gasps, one breathes in peculiar places, perhaps even be on the verge of crying! Hence the 16th note followed by the dotted quarter denotes the apprehension at the beginning of phrases! When one is off on a dangerous mission one will be saying goodbye to a loved one without wasting time by thinking about what to say? Will you have the luxury to be lethargic or sluggish? NO! Not if you mean your goodbye, and Manrico does! Thus the 16th note here will fulfill the purpose of determination, for by using it as a pick-up to every measure, Verdi gives the impression of urgency. “Ah si, ben mio” or “Oh, yes! My dearest”, is an urgent goodbye, a desperate one! It may even carry within its value the fear of death? Pregnant with emotion and with the potential tragedy, it is up to a good tenor to explore the countless possibilities of interpreting these words and rhythms. Some singers might disagree with that interpretation and that’s ok! As long as a singer sings his aria with purpose, ANY purpose, and as long as his notes and rhythms have been well thought-out for his own story-telling purposes, all is well. That is what one calls INTERPRETATION! 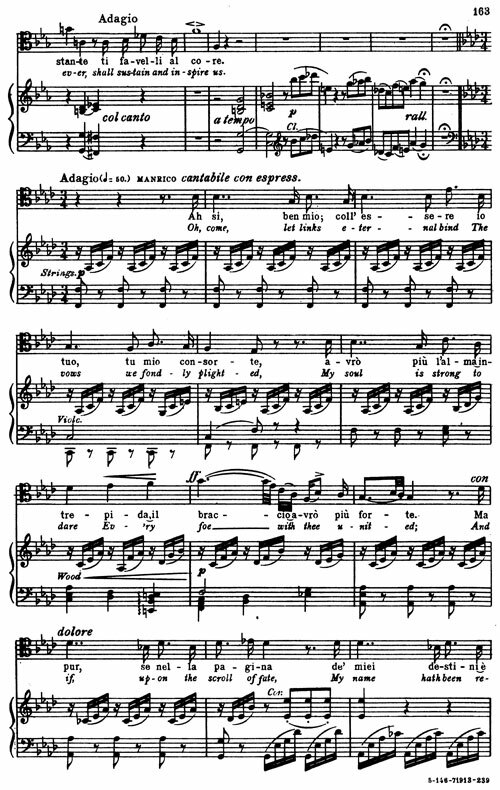 Looking further at the text one sees that the key signature for the aria is in F major and the tempo marking is at 50 or Adagio that means “slow”. In the vocal score the orchestra marks STRINGS in the accompaniment section. Then violoncelli, and then woodwinds. How is that important? Answer: Each type of instrument denotes a clue into the scene’s emotional ambience. In an orchestral classical score the introduction of woodwinds often implies the inner feeling of the heart and soul. And indeed when one looks ahead, Verdi gives the marking on the word “Ma” that means “but”, as con dolore or sung “with sadness” and it is done on the beginning of a new thought in the aria because of the word “Ma”. This along with the rhythmic specificity of a 16th note as a pick up to almost every measure up until then, means that there are deep feelings involved. And yes! If you look at Verdi’s marking for the start of the aria it says: cantabile con espressione. Cantabile the word alone signifies singing with expression. And here Verdi denotes espressione as if to stress the fact that this should be sung with as much passionate expression as one could muster. Of course, each singer has his own capacity for eliciting passion, the more the better since people want to see genuine human emotion, and I emphasise “genuine”. How could one achieve that? Understanding the words and rhythm do help. Pp. 208-220 in the following article by Martin Chusid might shed some light on the significance of tonality, rhythm and musical structure in the opera. Manrico here is bidding farewell to his lady love Leonora. He’s going to fight and try to save his mother (aka Gypsy who kidnapped him) who is taken prisoner at a foreboding tower and who is in the hands of his most hated enemy. We can’t all be in Manrico’s shoes! But emotion is a powerful thing and we all at one point or another felt loss, betrayal, fear of the unknown and perhaps even death! Coupled with imagination and the exquisite dynamic music of a great composer we can pretend, or more specifically, follow the clues. - This aria is an advanced aria, meaning, if one is just starting on his singing technique, one should be careful. - Depending on the voice and one’s teachers one could try singing it but if it’s uncomfortable in ANY WAY, drop it. Come back to it in 6 months. - Without a secure technique (meaning singing “un’aura amorosa” comfortably and with the marked pianissimos) making the dynamics happen in this aria will be futile. Even though the orchestration is not extra heavy, there still is the requirement to sustain a line for 3 minutes and to give it the diminuendi, trills and forti needed without perceived effort while singing over a fairly sized Verdi orchestra. - This is not a mainstream aria but it has many good things to study and even if one is not advanced enough to sing it, one could benefit from all the advice given regarding the professional way in which to approach any aria. Since the tessitura in the aria is high, breath regulation (NOT BREATH CONTROL) is of utmost importance. So is technique. But again the 16th note pick-up serves many a purpose. 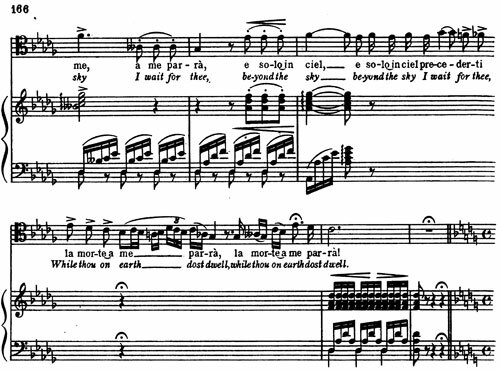 With it, Verdi gives the singer time to breathe between those 16th and the dotted 8th notes. Use them to calibrate; the tessitura is high and one needs every bit of help even if it’s in the form of a simple 8th note rest! (In the above phrase p. 163 in the system before the last, there is a high note A in the second measure. In order to sing that A-flat comfortably one, if he needs the breath, should cut the quarter note of G into two 16th notes and breathe on that G, canceling the liaison on “trepida,il” and instead, the G would serve as a pick up to the high note. That way, one would be singing “tre-pi-da [breathe] and on the same note of G sings a 16th note on “il” before leaping to the A-flat on the word “Braccio”. Of course if would be ideal to do it all on one breath). la morte a me [breathe and take your time] parra! Now, a phrase is exactly how one would say a sentence. It doesn’t have to be a complete sentence, but in singing, one always sings in complete phrases! (Oh yes my love, if it would be that I’m yours and you’re mine, I would have a stronger soul and stronger arms!) When one speaks it, this is the way it goes! However arranged it is, even if the music spans 2 systems, or 2 pages, the phrase stops when the thought stops. (Wagner wrote whole pages for Wotan’s wordy ranting that basically said: I’m angry! Pages and pages of music, that lasted forever!) in this case it spans systems 2,3 and 4 on p.163. SO in truth the complete phrase is: Ma pur se nella pagina de miei destini e’ scritto ch’io resti fra le vittime dal ferro ostil trafitto, fra quegli estremi aneliti a te il pensier verra’. E solo in ciel precederti la morte a me parra! Once a singer knows where to section the phrases and marks where he would take his breaths, he is ready to study the rhythm again. Singing the aria in rhythm and without words, is the first step, and then once the rhythm is secure, and one has understood the value of each musical note, one could add pitch and then finally, the words. Going back and forth between reciting the words so that they are easy to roll on the tongue, and singing in rhythm on one’s favourite vowel will prepare one to finally sing the complete aria, pitch and all. In order to shed light on how to sing the words, one has to demonstrate. This could prove a challenge in an essay form, since it is an aria and it does need to be sung. However, a good advice is not to get too tangled on the words when the aria is still in the beginning stages. I’m a soprano, and there are things that a tenor will agree with, and others where he will not! Please feel free to start a blog, or share a comment if you really need to add something!